This year, I celebrate Imbolc with a new song of my own. But Bran’s own blessed singers. To feed her clamoring nestmates. A harbinger of widow’s tears. To feats of strength and glory. The battlefield is her domain. Her children feast upon the slain. For every death is Corvid’s gain. Badb Catha claims her portion. The fire’s breath, the birth of words. From stone beneath his talons. Let Eagle soar the highest. With eyes of shining silver. Who feasts on stolen spoils. The hound’s helpmate, the rabbit’s end. And guards their fallen family. The footnoted version, complete with sources to untangle the dense allusions, is here. I’ve been working away on dozens of little projects, and then a million things happened at once. I’m still processing. I wrote a new song, and I love it. It started out on a very different path than it eventually carved for itself. I went to an event most of my closest friends don’t attend. And then, strangely, many of them were there with me. I competed in arguably the most prestigious regional Bardic competition and a friend and I won together. We began plotting a year of shenanigans. 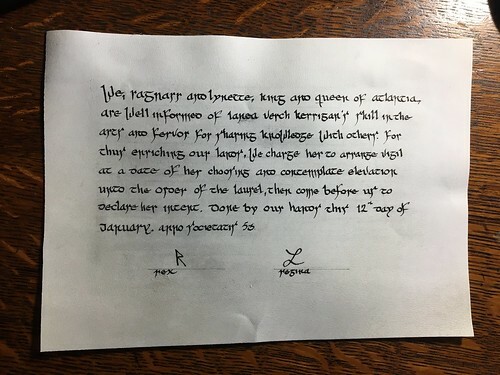 And then I was given a writ to contemplate joining the Order of the Laurel at Gulf Wars in March. My dear friend Sinn did the calligraphy on beautiful vellum. I never thought I would wind up in this position. I’ve operated on very strange paths throughout my time in the SCA, and while I haven’t actively spurned notice, I also haven’t sought it often. I want to sing and research and study and teach and make things, and I want to spend time with my friends and help out when I can. So now I’m rushing to finish piles of projects by early March so We can go throw a giant party and I can take on a major new volunteer job. Weird. It’s weird. More importantly, it’s astoundingly touching. An invitation to join this Order came because many many people spoke on my behalf, took notes on my work and spoke in my favor in hushed discussions. Once it was clear that it was happening, my friends came together to witness the announcement and speak publicly on my behalf. And then offers to assist in the next steps flooded in. In just a few days I was given completely tangible proof that people care about this weird work I do, and they love my art, and they think I am a good teacher and can help steer the arts community in a good direction. I’m flabbergasted. Truly. The song, which will continue to grow, is coming. My linen quilt is finished and wound up being a great project for learning. 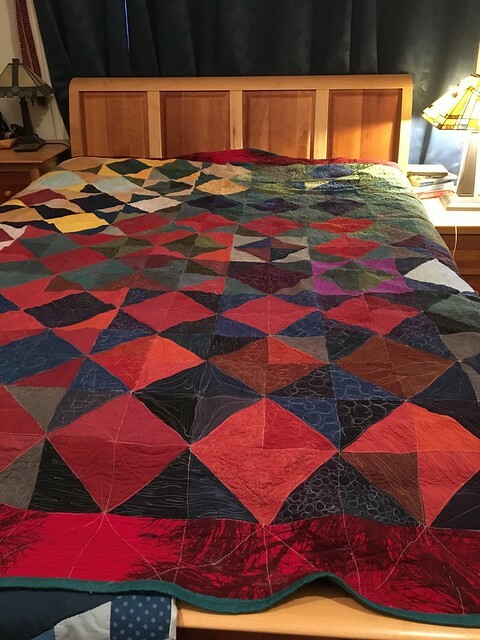 Because I worked primarily with linen garment scraps, my color selection was decidedly different from the quilt I based this project on. I pieced via serger, which is guaranteed to be a pain. It also leads to a fair amount of seam bulk, which is challenging to quilt. I’m happy with the results in spite of the challenges. I opted to lay the squares out in a squared off color wheel configuration. I like how much movement it has, even with such simple piecing and a relatively broad color palette. Once the top was pieced, I added a wide border of a lovely Marimekko red print and a green linen Marimekko backing, both of which I scored at a Crate and Barrel outlet sale a few years ago. Then I pin-basted it and used a walking foot to quilt around the blocks in a grid. That first round of quilting convinced me that quilting the whole thing with a walking foot in relatively straight line designs was going to be tedious and uncomfortable, since it would mean hefting so much weight so many times: it’s a queen sized quilt, and garment linen is significantly heavier than quilting cottons. 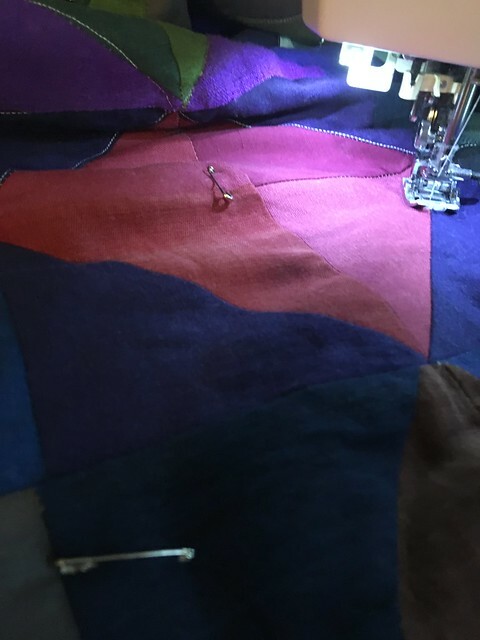 So I forced myself to be brave and try free motion quilting on a large scale. 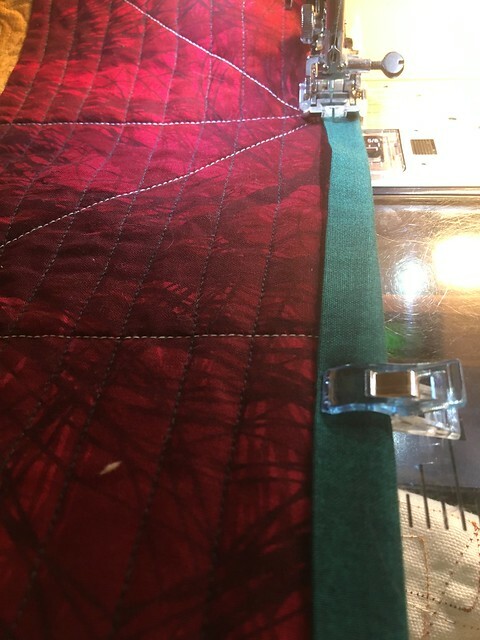 I’ve been hesitant to try it because it doesn’t come naturally to me, and I am far from expert, but the project made me much more comfortable with free motion quilting. 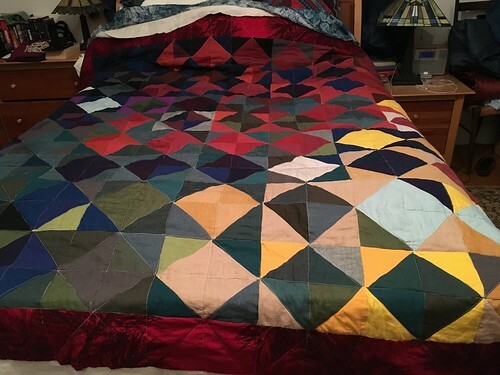 I varied patterns and threads throughout the quilt and learned which styles I’m more comfortable with. The finished quilting makes sense with the scrappiness of the top. I quilted the snot out of some of the sections and left others more open. I opted for a gorgeous blue-green shot cotton for a binding–I love it’s play against the red border. 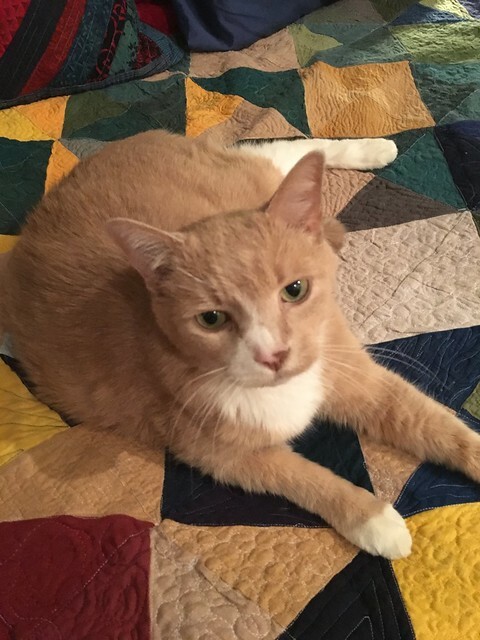 The finished quilt washed and dried up well, and this guy approves, so I’m calling it a victory. I went to a local SCA event yesterday called “The Wild Hunt.” They had a pair of A&S competitions, one of which intrigued me. “Best fix” was all about a correction or repair, and this coat fit the bill perfectly. 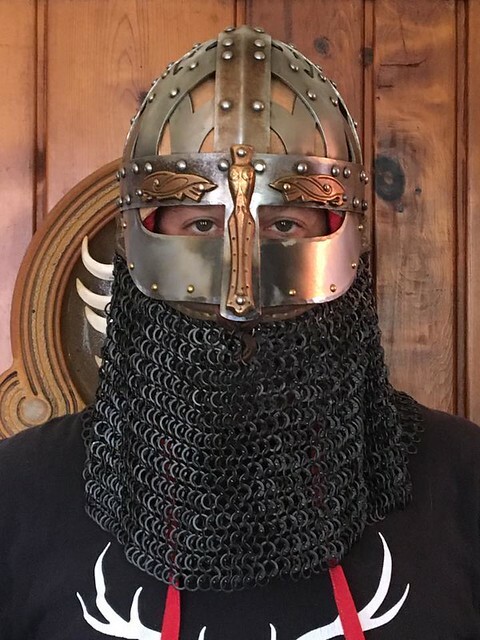 My partner Alherin began using a Valsgärde 6 helmet for tourney fighting in the spring of 2017. The helm is based on a Vendel era boat grave find from Sweden, dating to 660-710 CE 1, and thus later than the material he had previously used to guide decisions about his kit. In general, reproductions of extant early period armor need a great deal of modification to function for SCA combat, and many soldiers or warriors in the ancient and early medieval world had little gear beyond weapons and a helm. Helms like the Valsgärde 6 require the addition of bar grills or some other facial and neck protection, modifications to the size of eye openings, etc. Moreover, the sort of neck, body, leg, arm, and hand armor that functions well for SCA tourney combat was largely developed after the time period he chose for this kit. Alherin cobbled together a kit made up of both modern sports equipment (groin protection, padding, and kydex body armor) and later period items (splinted arms and legs, gauntlets, gorget) that function well and meet SCA safety requirements. 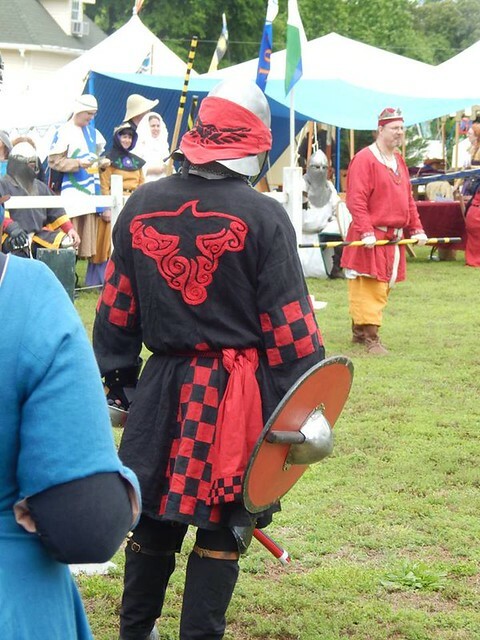 Once he had assembled and constructed a new tourney kit, I took on the task of covering the combination of reproduction and modern gear that worked for his fighting style so that he would look as good and as “period” as possible, given the scant evidence of Vendel era armor and textiles available. Valsgärde 6 has, arguably, the most beautiful helmet of any of the finds in the burial complex. But it has little else2. It is possible that the boat graves were robbed at some point, but whether natural or human intervention is to blame, we had no inhumed garment to use as a basis for this exact helm. I consulted a number of sources and settled on a modified klappenrock to cover his armor and serve as a quasi-heraldic garment so Alherin would be identifiable on the field. The v-neck of such a coat would expose his armor, however, and since we have no doumentable gorget or breast place options to turn to, I decided to use a round neckline with a button attachment instead. Ideally, a wool twill would serve as the primary fabric for a klappenrock, but washabillity, local weather patterns, and Alherin’s own desires took precedence and I used a heavyweight linen tabby instead. I opted to rely on the checkered patchwork of our tribe Preachain as an accent in the gores, along the placket, and on the sleeves. 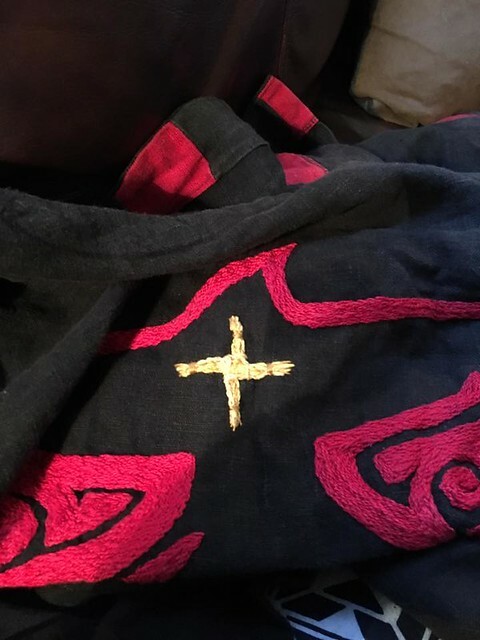 I also opted add embroidery to the back of the coat to please a dear friend3, choosing a design our dear friend Bran painted on one of Alherin’s shields. Knowing that the coat would face a lot of wear, I used a mid-weight pearl cotton for my embroidery fiber and relied on chain stitch for the majority of the work on that back piece. Before making the coat, I’d studied the history of embroidery for several years and built a class on the subject. I knew what stitches were common in period and what would wear well. I’d done some experimentation with embroidery as a repair method, and I know a number of people who are much better at drawing than I am, so I hoped to convince at least a few of them to sketch designs for me as need required. When Alherin stepped onto the field in this coat the first few times, I knew that friends would make a game of trying to break the button off in combat (none has succeeded thus far) and that the black and red colors our tribe relies on would fade with washing and the sun. 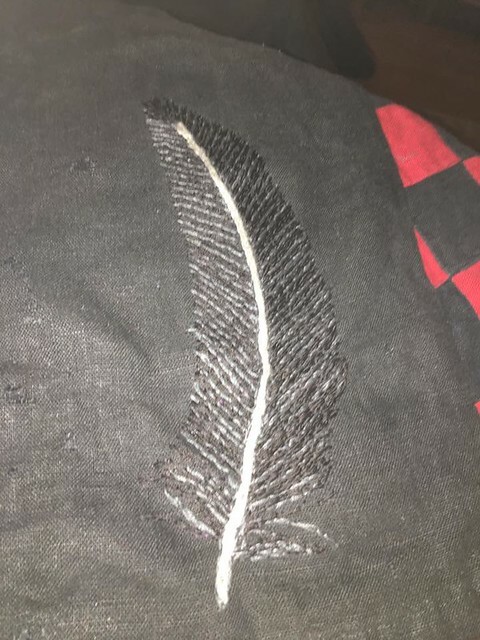 I also knew that embroidery developed out of repair techniques like pattern darning, and was ready to do some repair now and then. What I did not know was that his new splinted legs would eat the coat from the inside. He wore it for the first time in Spring Crown of 2017 and it took some minor damage, so I made some minor repairs. The repair process hasn’t stopped since. After several repairs were complete, he asked me to add a small Brigid’s Cross to the back piece to symbolize my own heraldry. Ever other stitch I’ve added post-debut has been a decorative repair. I may have created a monster. I have definitely created an amazing testing ground. 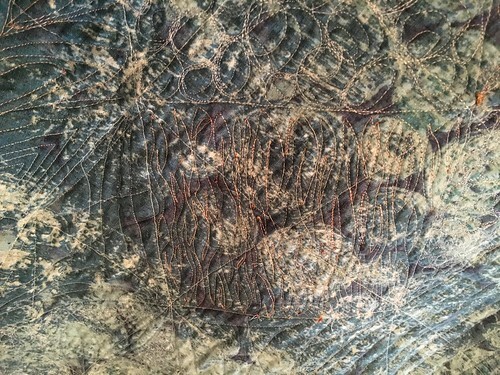 The cotton embroidery has fared far better than the silk, as to be expected. At least one of the detergents we’ve used has caused some very sad fading and dulling to the silk repair embroideries. 3 Ursus does not want anyone to have solid black, red, or white surcoats because it causes lens flare and color distortion in processing. We listen to Ursus’s guidelines because we adore him. I’ve never been wild about competitions, particularly Bardic competitions, because of a myriad of reasons. We all do things differently; we have different styles and time-periods that interest us; we focus more or less on spoken or sung pieces; favor different vocal styles; and on and on and on. I think I’ve participated in six as an entrant in the 30ish years I’ve been performing in the reenactment community. There have been competitions where I performed something but asked not to be entered in the formal judging, either because it was a competition to select a champion from a place where I didn’t live or because I was just trying out a brand new thing that wasn’t ready yet. Here’s the list of competitions I entered that I can call to mind. Some random event down south when the Torc Song was new: Valerian/Vale/Phil was the one who gathered the prize–a cup full of coins and beads–and the performances took place in the feast hall after dinner was over. They judged the winner based on the volume of applause. I won. Valerian was incredbly kind. I was 17 or 18. Strangers talked to me. It was dizzying and strange and I wanted to hide but I tried to pretend to be a person. Ice Axe, sometime in the early to mid 1990s. My armor was new and after I’d completely tanked in the tourney, I was press-ganged into entering it into static A&S on behalf of the folks who helped me make it–B-Zar and Bain–and it won something. I then had a surreal conversation with the Prince at the time, who awkwardly tried to talk me into doing some ludicrous embroidery for him. And then there was the bardic competition during the feast. Warning/Killy the Song was brand new (and had its original tune and evil pacing), and I sang that and won. And then I was lectured for about an hour by a person who shall remain nameless. Apparently it was wrong for me to receive two prizes in one day, and I shouldn’t really be entering competitons at all because I wasn’t an apprentice, etc. etc. My household was on the outs with the regional leadership, and I think I just ended up being the scapegoat for a minute. And that was when I decided that A&S competitions were maybe not for me. Some random pennsic, Etaine and I went to participate in the Chalk Man bardic competition. I did well but she nailed it with Rumble/Nine/Song of the Varian Disaster, which was relatively new. Truly. Nailed it. She won. People wept. Standing Ovation. Rending of garments. Marriage proposals. WON. And the organizers gave the prize to their house band because the competition was fixed. We called them on their trash and they admitted it was fixed but asked us to leave. Shenanigans ensued. I’ll leave it at that. I was not impressed. Gulf Wars 2013? 2012? My dear friend Mistress Gwen from Meridies convinced me to enter a performing arts competition–probably the “open.” I was hesitant because my voice was trashed, so I performed two spoken pieces: Dan do Emain Macha and Boudicca. I did well but didn’t win. A person who stayed at the bead cups by the static displays beat me by a bead. I was absolutely fine with the results and just needed to get back to camp to make dinner, and suddenly Gwen was nowhere to be found. Lo and behold, she had been carried away by other laurels and they were plotting and scheming. They ended up deciding to make up another award and brought a delegation of amazing people to our long hall for a command performance and award presentation. It was one of the proudest, most humbling moments of my life–and yes I realize that is a contradiction. But it was. I wept, kneeling on the stone floor of the hall with Vashti, who had the audacity to try to kneel to me. The significance of the moment was clear to maybe five people in the room, and it was amazing. Battle on the Bay 2014: Teleri heard me perform a spoken piece by the fire on Friday and graciously asked me to take part in the storytelling competition on Saturday. I planned to just listen because I had not prepared anything, but the folks there convinced me to enter. And I won. They were very kind, and I felt like a jerk. I felt like I butted in and wasn’t really following the rules. Ruby Joust 2018: There was a competition for the Baronial Bards. I am not one, because I don’t live in a Barony and I have refused treatied-in Champion in the past, hoping to help folks encourage newer bards. But my friend Mishee, the bard for Highland Forde, asked me to fill in for her. So I did, and I won. And I felt like a jerk who butted in and wasn’t really following the rules. Do you sense a trend? Here is the rub: I don’t like competitions because they make me feel like a bully. I have had the sort of education and performance experience that is not common amongst new bards. I’ve been doing this thing since I was a kid. But I don’t hold many honors within the organization for a variety of reasons. So people ask me to participate because they want to encourage me or to shine a light on me, but I feel like I don’t belong in that position. And just writing that makes me feel like I’m spewing out hubris. But I never, ever want to be the bludgeon that makes another artist feel like they’re failing. When a normal artist or artisan would have been seeking a Laurel to train with, I was in grad school neck deep in ancient Celtic languages, and my household was so far out of favor in the SCA that Atlantia would have preferred we did not exist at all. During that period of my life, people from very very far away asked me to apprentice to them, but I knew that rarely went well, so I declined. Now I am more aware of how my anxiety works and know accepting an apprenticeship would put me in a constant state of stress. I can’t do that to myself or those close to me–it would be madness. Madness. So I sit here, trying to map a path out of this conundrum. A friend and I are hosting a Bardic Challenge this weekend–not a competition. I think we would both like to steer these events in a different, more nurturing direction. I know I’m not alone in this angsty place. I hope we can all help each other. I don’t think there are any easy answers for me, but I’d like to keep other artists out of this position in which I find myself. strike lower through the barley-sprays. So arise and face me. I am poisoned with the rage of song. the blue and the gold-veined hyacinths? all the roots from the earth. but I have lost heart for this. I break the tough branch. I know no light in the woods. I have lost pace with the winds. How is it I can miss a poet so painfully, despite the fact that she died before I was born? Inspiration Rachel and I relied on for our poetry blog, and a beautifully fitting image of how I view reading. Michael Gambon reciting the poem. Need I explain? This is gateway Yeats. I’ve loved it since I was a child.